Our goal is to add something special to your already special day and to leave all the stress of transportation up to us. 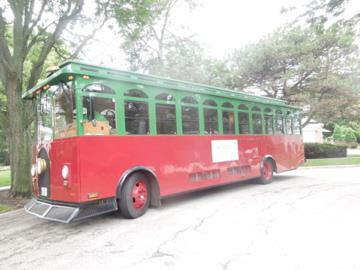 The Trolley is the perfect vehicle for many events such as Weddings, Prom, Homecoming, Family Reunions, Sporting Events, birthdays, and Corporate Functions. It will comfortably accommodate up to 34 passengers. In addition to a Driver all of our events have a Trolley Hostess to assist the driver by keeping your event on schedule and to help with any accommodations our passengers may need. This allows our drivers to focus on their main priority, safely driving the Trolley.